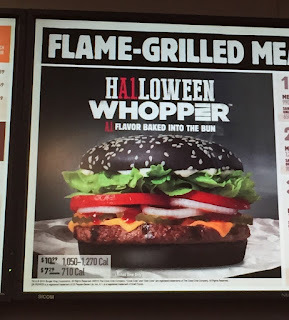 Today, September 28, 2015, Burger King launched a Halloween season Whopper made with Kraft's A.1. steak sauce. It's called "A.1. 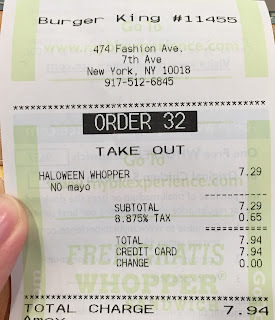 Halloween Whopper" but on the menu at the restaurant, it's spelled as "HA.1.Loween Whopper." 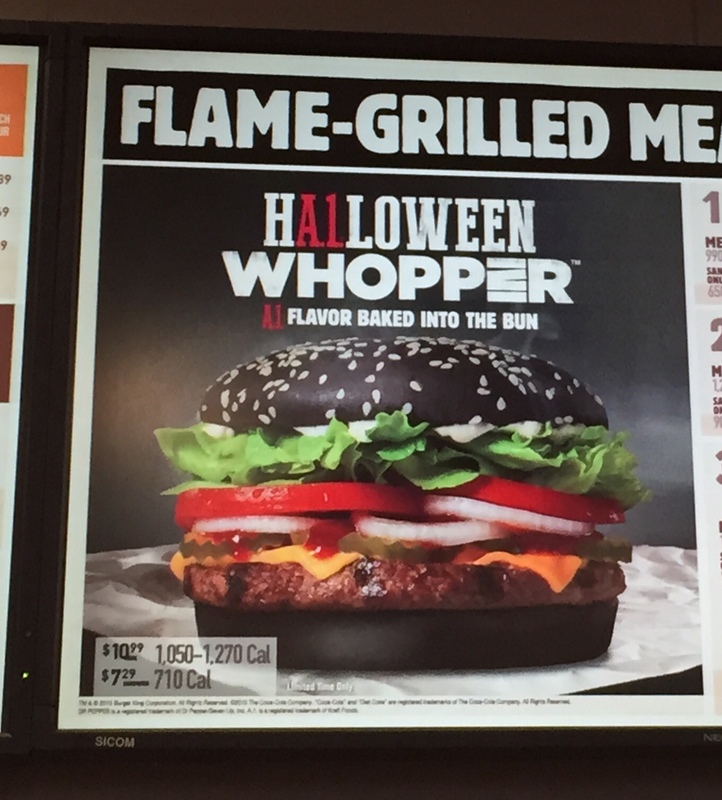 On the HP, this new and limited time burger is introduced, too. 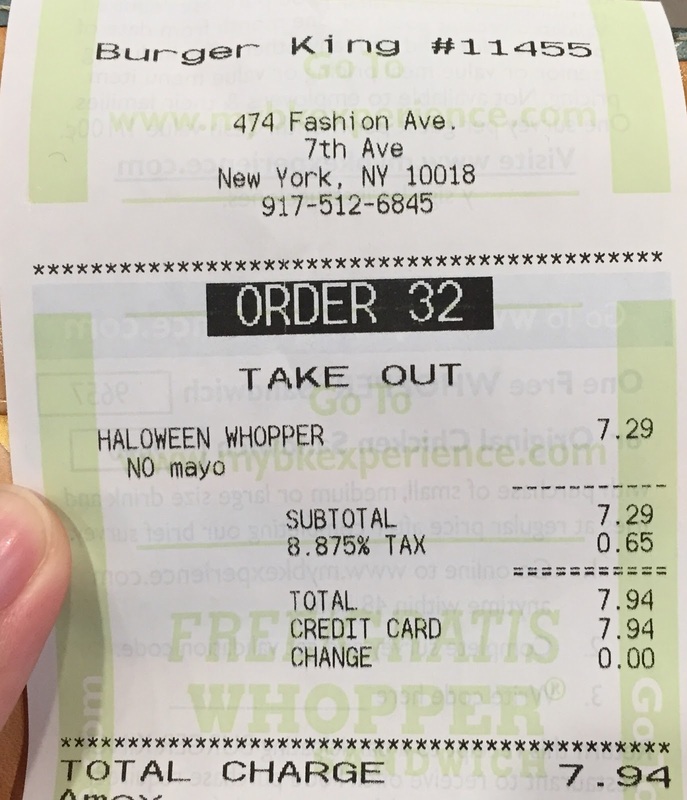 Today, I went to one of the branches in Manhattan and ordered it without mayo as it's a Whopper that uses mayonnaise. 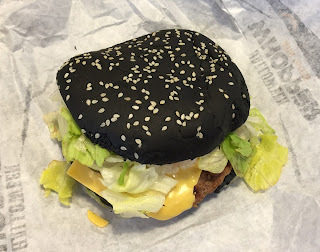 I had KURO Pearl that Burger King Japan launched in 2014, but unlike the Japanese KURO, which means black, the patty, cheese or sauce used for A.1. 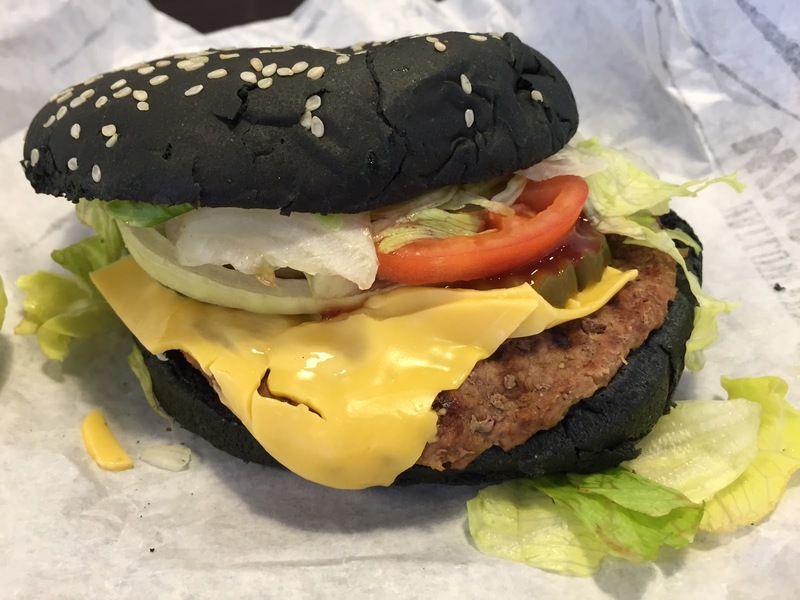 Halloween Whopper is black. According to a press release, the suggested price is 4.99 dollars but it was 7.29 dollars before tax, which is quite a few difference. In about 5 minutes or so, my A.1. 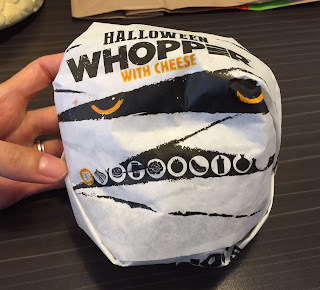 Halloween Whopper was handed. The wrapping paper was mummy and I thought it's neat. The other side of the wrapping paper after unfolding it. 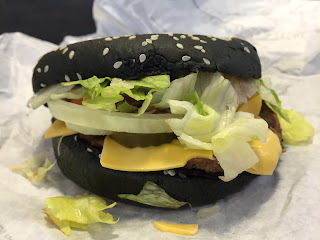 The bun was evenly dark black. Compared with KURO Pearl, the hue of the blackness was obsoletely much deeper and more matte. From the side; lots of vegetables. There're lots of lettuce under the upper bun. 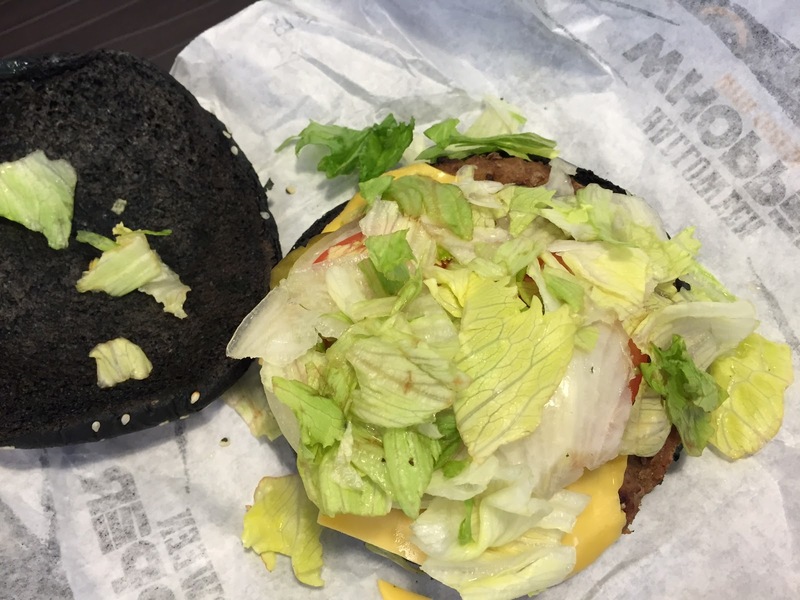 Underneath the lettuce, there're sliced onions, sliced tomatoes, A.1. steak sauce, pickles, a slice of cheese and a patty. 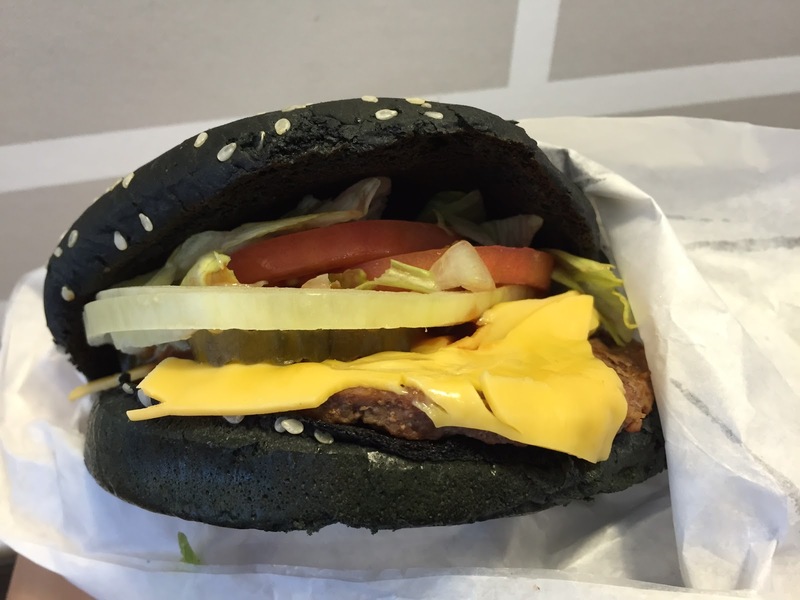 The inner side of the bun was also matte and deep black, and the bun is supposed to have A.1. flavor baked in, but I didn't sense anything when I had the bun as it was. 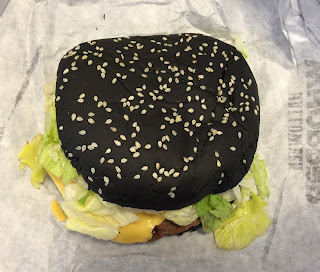 Except the buns, it's just a Whopper to make it short and I don't really have much to say. About the A.1. sauce, it's a product of Kraft and it's my first time to have it as long as I remember. 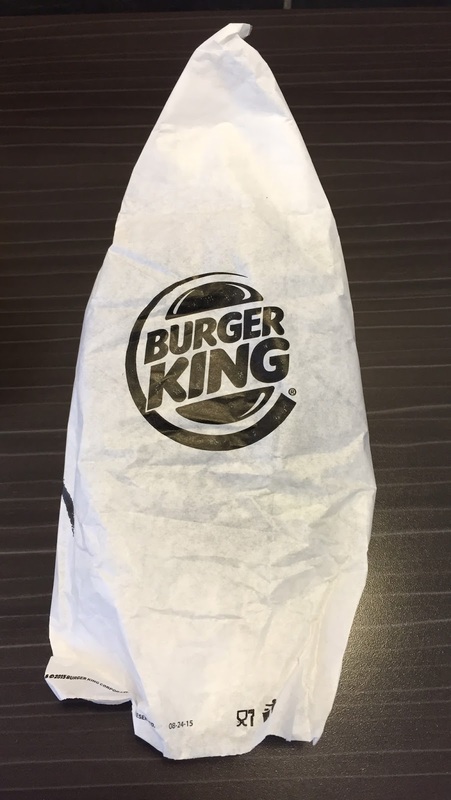 It had acidy flavor similar to vinegar with some citrus-fruitish sweetness and peppery flavor. 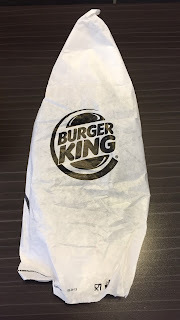 It's refreshing and went well with the patty and cheese, and even with vegetables as if the sauce was like a vinaigrette dressing.